My previous series of articles on crypto-currency covered Bitcoin mining on OS X. This series will focus on mining Litecoins. While Bitcoin has been getting the lion’s share of media attention lately with its recent bubbles and crashes and growing adoption, Litecoin has been slowly growing in popularity among alternative crypto-currencies (known as altcoins). Proponents of Litecoin argue that Litecoin should be regarded as silver to Bitcoin’s gold: easier and faster to transact smaller amounts. Proponents also argue that, by basing the proof-of-work on Scrypt rather than SHA-256, Litecoin mining will remain in the realm of consumer hardware, rather than limited to mining-specific hardware (like Bitcoin with FPGA’s and ASIC’s). While SHA-256 benefits from massive, parallel processing, Scrypt is built to be very memory-intensive. This means that, for the time being, mining Litecoins using your CPU (which is no longer profitable with Bitcoin) is still possible. You can also use your GPU to mine Litecoins, which gives me a 5x performance boost over CPU mining. One popular setup seems to be using your GPU’s to mine Bitcoins and use spare CPU power to mine Litecoins. This article will cover how you can use Mac OS X to mine Litecoins using your CPU. If you’re interested in harnessing your GPU’s power to mine Litecoins rather than Bitcoins, a future article will cover that topic. 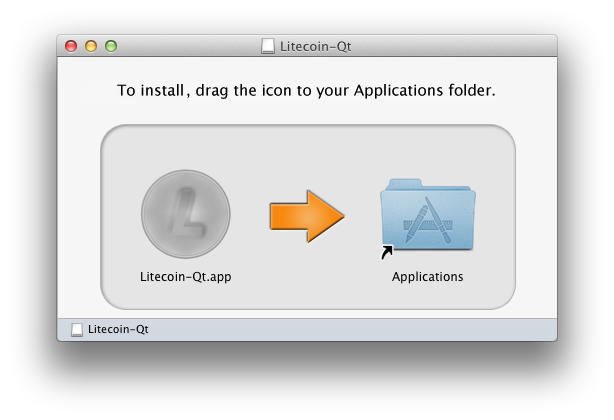 To get started with Litecoin mining on OS X, download the official Litecoin wallet application – Litecoin-QT – from the Litecoin website. With the Litecoin wallet you can actually mine from within the UI. Download the DMG file and drag the Litecoin-QT app to your Applications folder. Now, I didn’t cover wallet setup in my Bitcoin series as it was outside the scope of mining. However, as Litecoin CPU mining is generally done within the wallet application (though it can be done at the command-line), I want to make two things clear. First, encrypt your wallet. Second, double-check that the encryption phrase you’ve recorded is correct and works before you start making deposits. The same thing goes for your Bitcoin wallet. As stated above, the Litecoin wallet UI is capable of showing and controlling mining. While the Litecoin wallet has built in support for solo mining, pooled mining requires another download (see my first article for a brief overview of mining pools). The download is from a project called cpuminer. The cpuminer project was originally a CPU miner for both Bitcoin and then for Litecoin, when CPU mining for Bitcoin was still sensible. These days it’s been replaced in the Bitcoin world by cgminer and bfgminer, and is used in the Litecoin world for CPU mining. You can download the OS X binary for this cpuminer fork directly from the project’s GitHub downloads (32-bit, 64-bit). Once you’ve downloaded and extracted the cpuminer binary, called minerd, place it alongside the Litecoin-QT app in your Applications folder. This makes it possible to use the pooled miner from within the Litecoin wallet. UPDATE: The Mining tab has been removed from the Lightcoin-QT wallet. Skip down a couple of paragraphs for details on mining from the command-line. Now you’re ready to start mining. Switch to the Mining tab in Litecoin-QT. Change the Type to Pool Mining. Set the Threads value to the number of cores you have (double that if you have Hyper-threading). You can leave the Scantime value. It is only used if the mining pool doesn’t support long-polling, which is rarely the case these days. For the Server, Port, Username and Password, enter your mining pool information. Using P2Pool mining pools is fairly popular with Litecoin. You can use p2pool.org or any number of alternatives. Once you’ve got your mining pool information filled in, click Start Mining to get started. The Litecoin-QT UI will display the output from minerd and a running total of accepted and rejected shares, as well as average hashes-per-second. In the follow-up to this article I’ll discuss the utilities, steps, and tweaks necessary to mine Litecoins on OS X using your GPU. While this doesn’t give the same magnitude of increased performance found when mining Bitcoins on the GPU versus CPU, the increase is still enough to make GPU’s the preferred way of Litecoin mining. However, that also means dedicating GPU cycles to Litecoins rather than Bitcoins, which is a decision you’ll have to make. Litecoins aren’t nearly as established as Bitcoins, so they could be poised to gain in value like Bitcoin has. At the time of this post they trade at around $4 versus Bitcoin hovering around $125). Others call into question Litecoin’s benefits over Bitcoin, seeing it as a doomed clone. UPDATE: If you need to connect the CPU miner to a pool that doesn’t support Getwork, have a look at this post for a solution. This entry was posted in CryptoCurrency, Technology on May 1, 2013 by Nathanial Woolls (Nate). All of the machines are successfully running cgminer from your earlier posts. Any ideas on what might be going wrong? You could try using Homebrew to install libidn if you do not have it. The command “brew install libidn” should install it. Had you had MacPorts installed at any point? There’s a post here that indicates it may be a conflict between the curl installed from Homebrew and a previous installation from MacPorts. I’m just getting no where with setting up my iMac for litecoin mining. I’ve got an older iMac 3.06 GHz Core 2 Duo with OS X 10.6.8, so I can’t install Xcode without updating the OS which I don’t want to do. I’ve downloaded cpuminer, extracted the file and placed the “Exec Minerd” file into my applications folder with Litecoin QT app. Everyone else says you need to open Terminal and type in all of these commands and I have tried that and can’t figure it out. I’ve registered to get a “pooler” account, but I’m not even sure if I’m entering that correctly. I have one with ltc.kattare.com. This is so frustrating! I’m willing to pay you for assistance if you’d like to email me. I really appreciate you trying to assist me. I promise I’m not a complete computer idiot, it’s just that I have never worked with the command/terminal portion. As an example, I copied your link for the terminal to get Homebrew and pasted it into the terminal, hit enter…..nothing. I’ve been going through all of this stuff for days reading and trying things and realized that I had already downloaded “Homebrew”. It has so many files within the files. I don’t know what to do with all of them. Once I’ve seen this type stuff actually done once or twice, I’m good to go from there on out, but for whatever reason, I just can’t seem to get this going on my own by reading the instructions. I literally need it laid out before for the first time as, “a,b,c….” The people that have been able to get going with the instructions seem to have at least some experience with terminal, etc. I do know that this is the portion that if one single character or space is incorrect, nothing will work. I’m not completely sure of what specific info is supposed to even go into the “mining port address” within the Litecoin program itself. Does it literally need “http://”? unlike a web browser anymore. I’ve tried that all ways, but I realize if the commands themselves are incorrect, no amount of miner/worker info is going to make it work either. Again, I really appreciate your trying to assist and I wished I were able to understand what you have laid out better. I’d pay you as well. If you live around The Woodlands, TX., let me know. What I really need is someone to just talk me through it over the phone. I can’t think of anyone at work that knows this type stuff any better than myself. I am getting the same problem as gptsociety. Any suggestions on why this is? The Mining tab is no longer in the latest Litecoin-QT wallet app. I’ll update the blog post to reflect this fact. Sorry for the confusion! so wheres the mining tab and how to start mining? Hello, what do you mean, in the same folder as Litecoin Qt? I tried to put it in the Applications folder, in the same package, nothing works… keeps on telling me it doesn’t find the command? Hello – Lovely article!! Many thanks. Is there a way to enable the mining option in LiteCoin-QT? into your terminal you fix the curly quotes and make them normal quotes. I have a question. Do I need to setup somehow litecoin wallet to start mining or not? Do I need to setup server IP etc., or I can just click “mine”? maybe my question is really dumb, but I googled and searched the web for the answer about,… it felt like 2 million years. I didnt fint the answer. Where do the mined coins go? In my wallet file? Where is it saved, if I dont mine with Litecoin-QT? You will join a litecoin mining pool of your choice. On the website for your mining pool, normally located in the account area you will enter your wallet address. After that, create a new worker through your pool then use that with your miner. Any coins you collect while mining in your pool will be automatically added to your wallet (provided you entered your wallet address in your account settings on the pools website) after some time. into the minerd, what is the username and password that i should enter? also how do i connect it with pooled mining. Read my response to the post above yours. Do I need to worry about my MBP overheating? I’ve read that using MBPs for bitcoin mining can be quite dangerous. It was my firewall, sorry for the bother. I’ve done everything you said. I’m running os x 10.6.8. I put the ltc wallet and minerd into a folder in the applications folder in my user section. When I open minerd it says no credentials entered and it wont let me type anything. What do I do? Having tried all the settings and configurations I can’t get either card to run at more than about 70kh/s under os x 10.8.2 The biggest difference is in the intensity which seems to put more load on the gpu, but the highest it will go before falling over is 18, having spent much time with the thread concurrency can’t say it seems to make much odds. However if I boot into windows and use the exact same configuration I can get in the region of 200kh/s on each card in windows 7 (64bit) In windows it seems to work it much harder as within a short time the gpu fans are running much faster and louder. Even if I underclock the card. any ideas on getting comparative hash rates ? How can I set up CPU mining on a Mac that has no dedicated graphics hardware? I can confirm that minerd is in the same directory as the Litecoin wallet App. Any thoughts?..help would be appreciated. Great set of posts on this! I’ve got an Xserve running with Macminer, and it seems to be working mining Litecoin, i have switched on debug output and get the following – see below – however, i have let it run all night, and although it seems to be getting “work”, the top bar always stays with a “0 KH” and a message saying “Starting” – it never goes to anything other than “Starting”, and no coins obviously either. 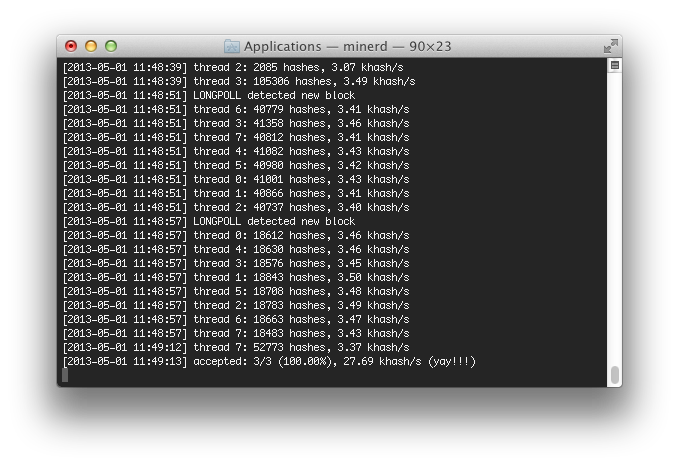 [2014-02-04 07:21:23] 4 miner threads started, using 'scrypt' algorithm.